The riverboat Sultana killed an estimated 1,547 people, mostly Civil War veterans returning home from battle, when it exploded and sank on the Mississippi River in 1865. The disaster claimed more lives than the Titanic (1,512) when the steamer's boilers blew just above Memphis, Mississippi. After nearly being broken in two by the blast, the overcrowded vessel burned as it drifted out of control until grounding on a small island in mid-stream. The scope of the disaster was overshadowed by other major news events of the day so it failed to make its mark in history. 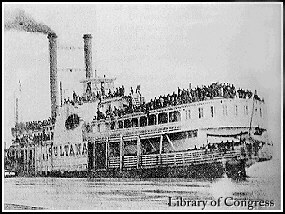 The Sultana went down on April 27, 1865. Lee surrendered at Appomattox on April 9 thus for all purposes ending the Civil War, President Lincoln was shot on April 14. As he lay dying there was a manhunt for John Wilkes Booth that ended on April 26. The Sultana was a side-wheeler built at Cincinnati in 1863 for the lower Mississippi cotton trade. It was registered at 1,719 tons and had between 75 and 100 cabins, enough space for an estimated 376 passengers. It also carried a crew of 85. The steamer was commandeered by the Union Army during the war to carry soldiers and material for the war effort. When the war ended, the Sultana was ordered to Vicksburg, Mississippi, to bring home a large contingent of Union soldiers that had been held as prisoners of war at Andersonville. Civil War historians know that the Andersonville camp was one of the disgraceful stories of the Civil War. The soldiers held there were poorly treated, malnourished and tortured. Many of them died before the war ended. Those crowding aboard the Sultana for that fateful trip were described as walking skeletons, many of them carried aboard in litters. They came in large numbers and were so desperate to get to northern hospitals or just get to their homes, they crowded the decks of the steamer. When the Sultana left Vicksburg on April 24 under the command of Captain J. C. Mason of St. Louis, it was carrying an estimated 2,200 people plus 60 horses and mules and 100 hogsheads of sugar for a ride north to Cairo, Illinois. While caught up in the rigors of war, the Sultana's maintenance was neglected. It was known even while the vessel was moored for its final trip, that there was trouble with one of the boilers. The crew took the time while in port to make some hasty repairs. The steamer made slow progress, moving upstream with an extra heavy load and pressing against a current that was extra strong from the meltdown of the winter snows in the north. There was a stop at Memphis where some fortunate passengers disembarked and the load of sugar was removed. The Sultana dropped her mooring lines just before midnight on the night of the 26th, and crossed the river to take on coal. Then it steamed off on into history. The vessel didnt get very far before the explosion. People in Memphis said they heard the blast and saw the flash. Several boats were dispatched to try to assist. Survivors were picked up along the river bank all the next day. Bodies of the ones who were not as lucky were still being sought for days afterward. Those not killed by the explosion or burned by the flames quickly drowned in the ice cold river. Many victims, already weakened by the horrors of Andersonville, were unable to save themselves. The survivors were lucky enough to find a piece of wreckage to cling to as they paddled or swam to shore, or they managed to launch a lifeboat from the blazing hulk. It was said that because of the press of the passengers and the great number of people crowded on the Sultana, a passenger list was never made. Consequently an accurate count, or the names of the people aboard the steamer that fateful night cannot be had. Some reports say as many as 1,700 people perished.